Nowadays, More and more people would like to drink some coffee with friends when they are free. While for the seller, what they should care is how to choose better coffee pouches to protect their coffee. So we will talk about it in this article. We would feel happy if it could help you guys in the future. If you want to have a better coffee pouch, choose the one with valve, because it has the following advantages: 1. Sealed package, no any damaged, which could avoid the secondary pollution; 2. Coffee pouch with valve is made up by some special materials, it has the effects to keep the coffee dry, which is good for storage and delivery; 3. It has the vacuum effects without the vacuum machine. Here is the theory of keeping fresh of the coffee pouches with valve: 1. These coffee pouches use the special aluminum foil package bags, it could completely keeping the sunshine, air and oxygen from the coffee, so that it could keep the coffee beans well; 2. The coffee pouch with valve could let the carbon dioxide out and then stop the outside air in. Therefore, the coffee could keep the initial fragrant with this type of coffee pouches; 3. It could be packed once the coffee beans roasted, for this coffee pouch won’t break due to the reason of the sack expands. All above is about how to choose the better coffee pouches. Hope it would be helpful for you. If you want to learn more about the coffee pouch, please visit East West Best Package Solutions homepage www.bestpackagesolutions.com. East West Packaging Solutions Co., Limited has been established as a quality manufacturer of flexible packaging pouches since 2009. 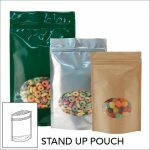 At East West Packaging Solutions, we offer a full line of stand up pouches, flat pouches, side gusseted pouches, flat bottom pouches, roll stocks that are manufactured to your specifications and standards.